Choose one of our stylish electric fire suites, and you can enjoy the cosy, welcoming warmth of a traditional fire with no complex installation to worry about. You don’t even need a chimney. Simply set the unit up against any wall, plug in and switch on. And there it is – a proper fire, without all the hassle! 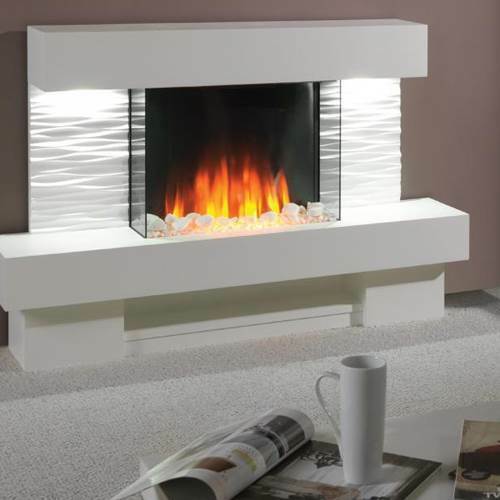 Our Nexus showroom has a range of electric fire suites on display, in traditional and more modern styles, all by leading brand names including Evonic and Flamerite. Browse the exciting designs and finishes on offer – from arctic whites all the way to black matt stove units – and let these realistic flame effects add a striking new focal point to your living room.